The year 1935 brought a successful effort to change our name to the “Federal Bureau Of Investigation” (FBI) from the “Division Of Investigation.” Our recent review of released FBI files from that year revealed hundreds of headquarter’s memos and field communications on the subject. Among the finding was a copy of one document in which Bureau Inspector, “Drane” Lester recognizes the dignity that manifests itself in the change. More notable is his final paragraph which contains the words that would embolden the hearts of all of the men and women of the FBI. Buried in an old 62 main file, his paper was likely attached to a preceding August 12, 1935 routing slip from Clyde Tolson to the Director. 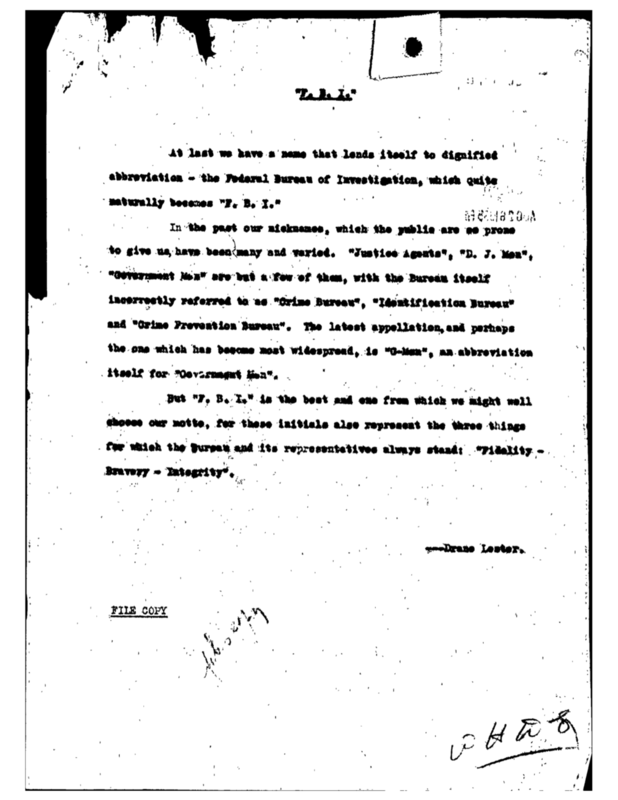 On it, Tolson recommended the appellation “F.B.I” begin use in Bureau publications. Lester's original document (copy) from FBI files. During time served at FBI Headquarters, he was one time editor of The Investigator magazine. In September, 1935 Lester’s words appeared in that month's issue of the magazine and the FBI's motto of "Fidelity, Bravery, Integrity" was born. Those same words would soon take their place on the new FBI seal. After only eight years with the Bureau, Lester resigned from the FBI in 1940 to seek other employment. Tragically, he died in an automobile accident in June, 1941 at Elizabethtown, Kentucky. Single during life, he was returned to his father for burial in Batesville, Mississippi.